Today I’m happy to share an exclusive interview with the talented Libba Bray with you, to celebrate the release of The Diviners, the first book her new YA series. 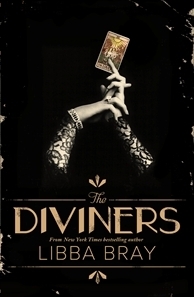 You can read my review of The Diviners here! 1. What was your inspiration for this novel? In particular, what about the 1920’s caused you to set the novel there? I’ve always been interested in the 1920s because it was such a colourful period in history: the flappers, the slang, fashion, jazz, Prohibition, the Harlem Renaissance, bootlegging, the Ziegfeld Follies. There was so much happening, too, in terms of the shaping of modern America, everything from the philosophy of “the business of America is business” and Keeping Up with the Joneses (which, of course, leads to a pretty spectacular fall in ’29) to the rise of evangelicalism and xenophobic fears of immigration and anarchism which result in some pretty bad laws, such as the Immigration Act of 1924 and Virginia’s Racial Purity Act. So the go-go-go party atmosphere of the roaring 20s masks some rather ugly aspects of America’s past. That conflict is inherently dramatic. But I’m also a big genre reader, and as I was rereading (the non-genre) The Great Gatsby, I thought, “Hey, you know what would make this seminal American literary work even more awesome? Ghosts and ritual murder.” You know, like you do. 2. What kinds of research into the occult did you do while writing The Diviners? What was that like? I’ve always been fascinated by religion, cults, the occult, the supernatural and the like. I think some of this stems from my having been brought up in the church—my father was a Presbyterian minister. Those Bible stories to me always seemed like stories about magic: The parting of the Red Sea? Lot’s wife turning into a pillar of salt? Passover? Dude—those are some A-level “Star Trek”-worthy special effects there! As a kid, I also liked reading about myth, folklore, fairy tales, ghost stories, and magical tales like C. S. Lewis’ Narnia and Edward Eager’s Half-Magic. And my great-grandmother used to tell me spooky tales about her grandmother who was supposedly a psychic who could speak to the dead. So I come by my interest in the subject honestly. What is secret or shrouded in mystery is always titillating. I’m interested in the idea that whole religious and/or occult belief systems can rise from this very human desire to avoid fear of death, failure, loss, and misfortune—and to have someone or something to blame when things go wrong. So that’s preamble. As for research, I read a book called, Occult America: The Secret History of How Mysticism Shaped Our Nation by Mitch Horowitz. And I went to Salem, Massachusetts, home of the Salem Witch Trials, to do a little poking around into witchcraft and various aspects of America’s occult past. I read up on all sorts of things from the tradition of cunning folk in the 17th century to the Fox sisters in Hyde, NY, Aleister Crowley, the prophecies of Edgar Cayce, and some of the more mystical aspects of Christianity, Judaism, and Voudon. But I did not play with an Ouija Board, because as much as I’d like to think I’m a perfectly rational person, those things scare the crap out of me. 3. Evie is often looked down upon for her carefree and sometimes extravagant ways. She never lets this get her down, however, and I greatly admired her for it. Is Evie inspired by anyone you know? Last but not least, many years ago, I was going through a box of my grandmother’s photographs when I happened upon a photo of my grandmother beside a lady I didn’t recognize. She was looking at the camera like she could take it in a bar fight. “Who is that?” I asked. My grandmother raised an eyebrow and pursed her lips and said, “Oh, THAT’s Evangeline. She was trouble — ‘hot to trot’ as they say.” Well, I knew right then and there that I needed to write about somebody named Evangeline someday. And she’d need to be a real hell raiser. 4. Can you say a few words about the process of writing The Diviners? Did the characters come first, and then you built the plot around them, or vice versa? Often for me, it’s the idea that comes first, and that is followed fairly quickly by characters, because it’s people that I’m most interested in writing about. The idea was that I wanted to set a supernatural, darkly political tale in 1920s New York City. I had no idea what form that story would take (other than that it would be long-form, a series) and I wasn’t sure if it would hew more closely to American history or if it would be an alternate history or take place in a parallel universe. I wasn’t even sure which part of the 1920s I wanted to cover. I just kept jotting down notes in my ever-present notebook and asking myself questions: Was there a doomsday cult? (That idea was recycled into The Brethren storyline.) What sorts of powers did these people possess? Was this a world in which magic was known or hidden? That sort of thing. I sketched out a basic storyline, drafting up what I thought it would be about. Of course, the story changes so much in the writing that most of what’s in the original draft flies out the window. And there was quite a bit of research: the NYPL; the New York Historical Society; the Paley Center for Media, where I listened to old radio including speeches by Calvin Coolidge and Charles Lindbergh; two historical walking tours; tons of books; and the services of a self-professed “research maven,” Lisa Gold, a librarian in Seattle who helped me find everything from primary sources on Follies girls to statistics on the Great Migration. 5. If you could choose any event in history to witness, what would you choose and why? Wow, what a great question. Of course, there are many events I’d like to witness—probably from a safe, hygienic distance. (People weren’t big on the bathing, and Bubonic Plague doesn’t sound like much fun. I’m just saying.) I’d love to go back in time and see what the basis was for the Arthurian legends as well as most major religions. (And then I’d like to say, “Uh, dudes? This is going to cause some major issues down the line…”) I’d love to hang out with William Shakespeare for a day. Ditto Martin Luther King, Jr. And because it’s one of those mysteries that I’ve long been curious about, I’d like to know exactly what happened during the Kennedy assassination. 1. Did people pos-i-tute-ly talk like that back then, or is it Evie’s own brand of speech? Flappers pos-i-tute-ly did knock back the slang like gin. Some kind soul posted online a Flapper’s Dictionary, which was printed in the July 1922 edition of Flapper magazine, and it is chock full of the most amazing slang. So you could know whether a girl was a Bearcat (“a hot-blooded or fiery girl”) or a Cancelled Stamp (“a wallflower”). 2. What is Evie’s theme song? Hmmm … possibly “Wild Women Don’t Get the Blues,” written by Ida Cox in 1924. 3. What are you reading right now? I’m mostly reading a lot of research right now since I’m diving into DIVINERS #2. But I’ve got a lot of things on my TBR list: Code Name Verity by Elizabeth Wein, The Twelve by Justin Cronin, The Fault in Our Stars by John Green, and Master of the Mountain: Thomas Jefferson and His Slaves by Henry Wiencek. At this point, my TBR pile is about the size of a small table. I want to thank Libba for taking the time to answer these questions, especially amidst the turmoil that the storms caused for her. It’s been wonderful to get to interview you Libba! And I can’t wait for The Diviners #2 🙂 Your to read pile sounds blissful – mine is a whole room (no kidding, the spare room has two shelves of unread books on it).